The practice of cultural diplomacy is not a new one for the Kingdom of Saudi Arabia, but its engagement and evolution is developing at a rapid pace. The Institute for Cultural Diplomacy, based in Berlin, Germany, would say that the essence of cultural diplomacy is “to educate, enhance and sustain relations in order to build dialogue, understanding and trust between all peoples.” So one could argue that Saudi Arabia began its cultural diplomacy long before the French created the Alliance Francaise in 1883, the UK the British Council in 1934 or the Germans the Goethe-Institut in 1951, with the tradition of the Hajj, the Islamic pilgrimage to Makkah that dates back to the 7th century. In this powerful religious pilgrimage, Muslims of every nationality, race and ethnicity, every culture, and both men and women, pray on the same mats, drink from the same cups and participate in in total peace, harmony and respect every year. The annual participation in the Hajj is massive and growing every year. In 2018, 2.4 million pilgrims participated, which is perhaps the biggest target audience reached by any cultural diplomacy initiative worldwide. The Hajj creates a framework in which all Muslims can get to know each other and build understanding and trust in the context of peace and respect. The Goethe-Institut, with offices in 98 countries worldwide, would be extremely pleased if it could reach a target audience of 2.4 million; however, only 246,000 people take part in its courses each year. Despite the great leap forward in the liberties and opportunities that have recently been afforded to Saudi women — not least the celebrated lifting of the driving ban in June — the tradition of cultural diplomacy with women in the Kingdom was started in 2003, when the field of women and sports as cultural diplomacy was unofficially launched by Lina Khaled Almaeena. She founded Jeddah United Sports Co. as the first private sports company in Saudi Arabia to train girls and boys in team sports, including basketball, volleyball and soccer, and promote the culture of sport in the Kingdom. At the time, the government did not license female gyms or clubs, and only a few elite private schools offered sports for girls. The team’s players faced a backlash from disapproving family members, texted threats, and harassment by the religious police, Saudi Arabia’s official enforcers of strict social mores. But today, after a long campaign to change attitudes toward women’s athletics, the Saudi government has written them into Vision 2030, its economic development plan to improve infrastructure, encourage community sports and support elite competitors. In 2012, Saudi Arabia sent its first women to the Olympic Games. In 2016, another football team was founded: The United Eagles, comprised of 21 women aged 18 to 22 years. 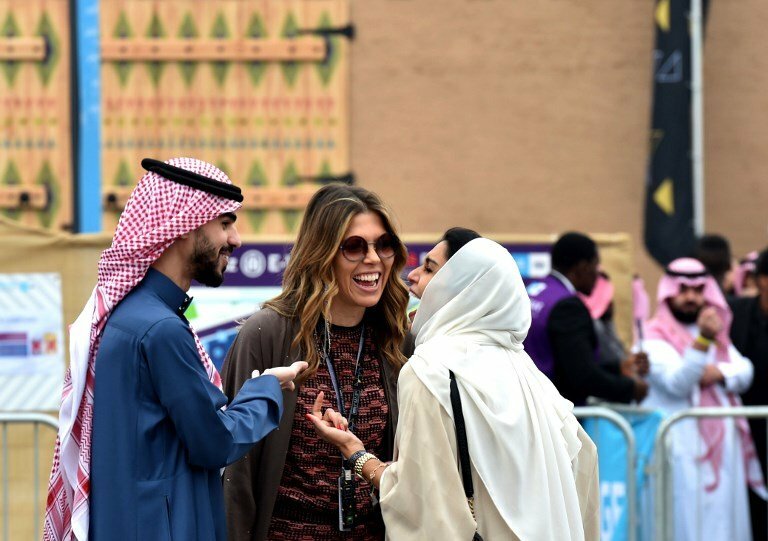 The next year, Saudi women attended the official event to celebrate the 87th National Day of Saudi Arabia in Riyadh; an event that had traditionally only been for men. In October 2017, history was made when Princess Reema bint Bandar was named as the first woman to lead a federation covering sporting activities for men and women, as she was made president of the Saudi Federation for Community Sports. The development of women and sports as cultural diplomacy continued to rapidly evolve when, in March 2018, female teachers joined sports training programs in three major Saudi cities. Then, in October, the first Saudi female hockey team was founded, which was swiftly followed by the first Women Bowling Championship and the first women’s martial arts tournament. We are also witnessing the development of cultural diplomacy in the fields of entertainment, tourism and the arts. We are also witnessing the development of cultural diplomacy in the fields of entertainment, tourism and the arts. In 2017, it was announced that the 35-year ban on public cinemas in Saudi Arabia was finally to be lifted, opening up a domestic market of more than 32 million people, with some 300 cinemas and 2,000 screens anticipated to open across the Kingdom by 2030. The last year also witnessed the first female-only concert, with the event “Riyadh Nights” featuring Emirati singer Shamma Hamdan and Saudi Arabia’s Dalia Mubarak. Meanwhile, rapper Nelly and renowned Greek musician Yanni were among the first international artists to hold concerts in the Kingdom. In December, Saudi Arabia made headlines as thousands of people made their way to the Formula E race in Riyadh, which was followed by a massive concert. Thousands of young men and women stood next to each other, singing along to famous songs by international singers and DJs such as David Guetta, Enrique Iglesias, The Black Eyed Peas, Jason Derulo, One Republic and popular Arabic singer Amr Diab. Saudi Arabia is also making sincere efforts to facilitate greater and easier access for cultural diplomacy to take place through international tourism. For example, in December it was announced that citizens of the 26 Schengen member countries will no longer need to apply for a regular visa to travel to Saudi Arabia. Instead, they will only need to apply online for an e-visa, thus avoiding the time-consuming process for obtaining a visa. As an example of the recent tourism boom, over the last two years both Riyadh and Jeddah have been drawing more hotel groups and brands — both local and international — on the back of major infrastructure projects and easing visa requirements. According to Colliers International, Riyadh’s hotel inventory includes 119 properties comprising 16,441 rooms, while Jeddah’s stands at 92 hotels with 11,276 rooms. This number is set to increase, particularly in Riyadh, which is currently leading the hotel boom in Saudi Arabia, with 48 projects in the pipeline, followed closely by Jeddah. The growth is reflected elsewhere too. Nearly 60 percent of the Kingdom’s construction pipeline of 143 hotels (as of February) was forecast to open in 2018, according to a Saudi Arabia Hotel Construction Overview report by TopHotelProjects. Riyadh and Jeddah continue to rank highly in the Middle East’s top 10 most active cities for hospitality development, sitting third and fourth respectively, the report revealed. In the arts, women have always stood on equal if not possibly higher ground than men. In fact, women have been huge trailblazers in the arts and culture sector of Saudi Arabia, not just as artists but as art professionals and as powerful patrons of the arts. For example, artists Safeya Binzagr and Mounira Mously jointly held the first public art exhibition in Saudi Arabia in 1968; Shadia and Raja Alem were the first artists to represent Saudi Arabia at the Venice Biennale in 2011; Princess Jawaher bint Majid bin Abdulaziz Al-Saud established in 1990 the Almansouria Foundation, the first art foundation of its kind to support Saudi creativity; and Effat Fadag and Zahra Al-Ghamdi introduced novel and unconventional notions of conceptual art to the King Abdulaziz University arts programs. Another powerful example of recent Saudi cultural diplomacy saw a strengthening of Saudi-Lebanese relations with the Winter at Tantora festival in Al-Ula last month. This event saw the Lebanese soprano Majida El-Roumi perform in the Kingdom for the first time. Amid the background of tense political and diplomatic relations between the two countries over the past year, the Kingdom’s recently appointed Minister of Culture, Prince Badr Al-Farhan, decided to invite El-Roumi and more than 100 other Lebanese, including former presidents and prime ministers, officials, representatives of all sects, beauty queens, singers and prominent journalists and intellectuals. The event turned out to be a great success of cultural diplomacy, as both the Saudi hosts and Lebanese guests experienced a beautiful cultural experience, bringing their two cultures together in harmony and peace. Therefore it is quite impressive to see the rapid development of a long-held tradition of Saudi cultural diplomacy. If the Kingdom continues to push the development of cultural diplomacy at both national and international levels, it is bound to see many benefits in terms of increased tourism, international investment, and international PR in general.